The first time I saw Irena McCormick's home was in 1988. I was on my way to visit my sister in Charlottesville when, after several hours on the road, I saw this wonderful house right next to U.S. Highway 29 in the small community of Covesville, Virginia. The architecture was remarkable with its gables and steep pitched roof, and small, stained glass windows. And there was a gazebo built right onto the front porch. On subsequent trips I found myself looking forward to Covesville and the house with the gazebo. It became my landmark, and I suppose it was inevitable that it would become the subject for one of my paintings. 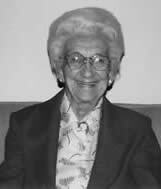 When I met Mrs. McCormick, I found a five-foot bundle of humor with sparkling blue eyes and a zest for life that would be commendable in someone half her 103 years. Best of all, I discovered that she is a fellow artist. She showed me some of her oil paintings, which are very good, and her quilts, which demonstrate a natural grasp of color, balance, and design. With that background I was not surprised to learn that she had designed the house herself. 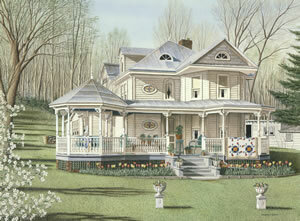 It was originally a small, four-room dwelling when she and her husband, A.W. Norvelle, the railroad telegrapher with whom she eloped just after graduating from high school, bought the property. The four-room house became the core around which "Concaw," as her grandchildren call her, made additions according to a plan that she carried in her head, to accommodate a growing family which eventually included seven children. The crowning touch was the porch. "I had always wanted a big porch ... with some roundness to it," she said. And she cut and nailed every; board in the porch floor herself. 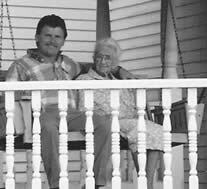 After Mr. Norvelle died, she married Emmett McCormick and for ten years the house was known as "The Maple Lawn Tourist Home." This was in the days before motels sprouted along the highways. Her guests came from all over the United States, Canada and Europe. All were welcomed and fed, including dogs, cats and even a monkey and a parrot. Some of her guests would return year after year and she made lifelong friends who would write to tell her of their travels and fondly recall the croquet games on the front lawn and the southern cooking. 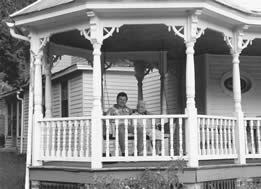 Concaw traveled also - all across the country and into Canada, but she was always anxious to get back to Covesville and her dream house where she could sit on the swing in her gazebo and read and watch the travelers go by on Highway 29.